Dr. Smith's ECG Blog: Insulin Overdose: Does this ECG help to Guide your Management? This patient with diabetes, but no other health problem, presented after a large insulin overdose. What finding fits with insulin overdose? And how does it help to manage the patient? Answer: There are down-up waves in several leads, especially V3. The upright part is a U-wave, not a T-wave. The diagnosis is hypokalemia. K was confirmed low at 2.6 mEq/L. 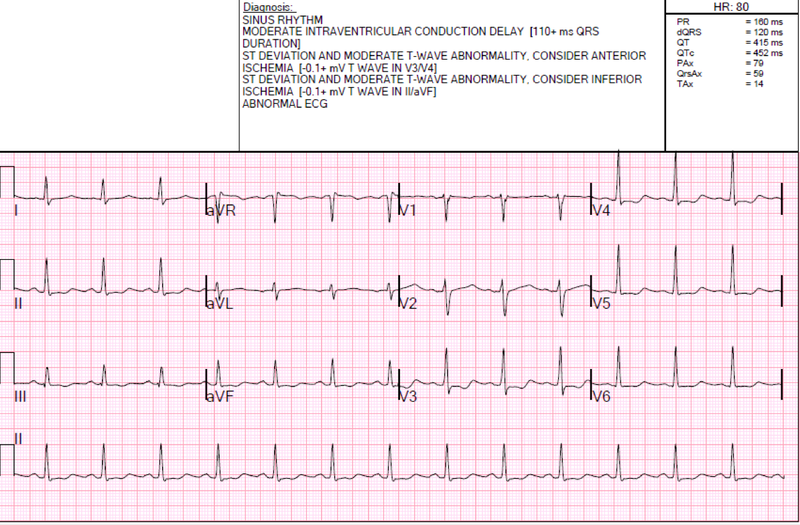 The ECG finding may persuade you to partially correct the K in spite of the absence of total body K deficit. Insulin, as you remember, lowers potassium by helping to "shift" postassium from the extracellular space (including intravascular) to the intracellular space. We treat hyperkalemia with insulin and dextrose in order to lower the extracellular K.
But of course this does not change the total body K. When the overdose resolves, all that intravascular K will again become extravascular. So should we treat the hypokalemia with potassium? Treating with potassium will increase total body K, and put the patient at risk for "potassium rebound" (hyperkalemia) when the overdose resolves. (See the case below of a patient with Thyrotoxic Hypokalemic Periodic Paralysis who was treated with K supplementation and became severely hyperkalemic and died after the attack resolved). But the presence of U-waves shows that this low K is having an effect on the heart. Does this prove that the risk of dysrhythmia due to hypokalemia is higher than without hypokalemic ECG abnormalities? I think so, but without hard evidence. I can find very little data correlating the ECG with dysrhythmias in hypokalemia. It is established as a truism that hypokalemia causes fatal ventricular dysrhythmias, and I don't seriously doubt it, but it is remarkable how little actual data there is. I personally have treated several cases of fatal and non-fatal ventricular fibrillation in which the only apparent cause was hypokalemia. I am not aware of any hard data correlating ECG findings of hypokalemia with dysrhythmias. It is my belief that if the ECG has manifestations of hypokalemia, including ST depression, prolonged QT and U-waves, that the risk of dysrhythmias is higher. Thus, it is my belief that these U-waves are a marker for dysrhythmias in this patient and one reason to supplement with potassium, in spite of the risk of K rebound. In a patient with good renal function, one can generally use furosemide to aid in the renal excretion of excess potassium. But that did not prevent the death of the patient described in the report below. An interesting alternative to giving K in such patients is the use of beta blockade. This may work for periodic paralysis, as the mechanism of action in thyrotoxic periodic paralysis involves beta agonist effects. It probably would not have any siginificant effect in raising the K in a patient with insulin overdose. In any case, one must be very careful with K supplementation when hypokalemia is a result of shift rather than a result of increased total body K. I would not supplement if the ECG showed no evidence of hypoK, as I believe the risk of hypokalemic dysrthythmia would be small. The patient was given supplementation with potassium and had a good outcome. What are other causes of hypokalemia without a total body K deficit? --Beta aderenergic agonists, including bronchodilators and epinephrine, result in potassium shift (and are thus also used for hyperkalemia). Patients in out of hospital cardiac arrest frequently present with hypokalemia because of the prehospital epinephrine. Those whose diuretic therapy resulted in occasional K values less than 3.0 developed, on Holter Monitoring, "complex ventricular arrhythmias," including 7 episodes of VT, at twice the rate of the other patients. Fatal Dysrhythmia Following Potassium Replacement for Hypokalemic Periodic Paralysis. Effects of potassium supplementation on the recovery of thyrotoxic periodic paralysis. Nice illustration by Dr. Smith in this case on “the art of medicine” — in which he explains his rationale for how logical presumptions (albeit without hard evidence) can be applied to ECG interpretation for assistance in management of a patient with insulin overdose. I’d add the following points regarding this case. In addition to the U waves — there are other ECG findings in this tracing that are consistent with hypokalemia. These are: i) ST segment flattening; and, ii) slight J-point ST depression. Both findings are present in multiple leads — which is consistent with the metabolic disturbance of hypokalemia. In my experience, correlation of the ECG for the presence and severity of hypokalemia is less than perfect. That said, by the time U waves overtake underlying T waves (as is the case in this tracing) — the likelihood of hypokalemia is greatly enhanced. Interpretation of the tracing shown in this case might be quite different if instead of a patient with diabetes “but no other health problem” — the history was from an older individual with increasing angina over the past few days. In this later case, the diffuse ST segment flattening with slight depression + ST elevation in lead aVR should prompt concern about ischemia with potentially significant underlying coronary disease. Serum electrolytes would clearly need to be checked — but even if serum K+ was low, one would still be left with the question of whether there might be superimposed coronary disease with recent ischemia. Clinical correlation, finding a baseline tracing on the patient, and follow-up tracings once serum K+ was corrected might be needed to sort things out. This differential diagnosis is clearly of less concern in the current case in which the patient has no prior or recent history suggesting coronary disease. That said — serial tracings may still prove very helpful in guiding management. With K+ replacement — one would expect reduction in U wave amplitude, with restoration of clear definition between the end of the T wave and beginning of the U wave. ST segments should also normalize (or at least improve). Following the rational proposed in this case — reduction of ECG findings consistent with hypokalemia on follow-up may assist in signaling when to stop supplemental K+.